Here’s a very interesting documentary called Made For Play by The Spiel, that takes you through the entire process on how a board game gets made at the factory. While at times it seems like a giant commercial for Ludo Fact – the printers that they use to show every step – it’s still a great video for anyone who’s thinking of getting into publishing their own board games. Lots of interesting insights into all the different elements that make up a new game. Belfort mini-promo now available to all! When the second printing of Belfort came to our shores last month, they also came with a mini-promo that consisted of three new guilds! These guilds can be mixed and matched with all your other guilds to keep replayability high on the game. There was a bit of kerfuffle when current owners of the game couldn’t get their hands on this neat little promo – but that is now rectified! 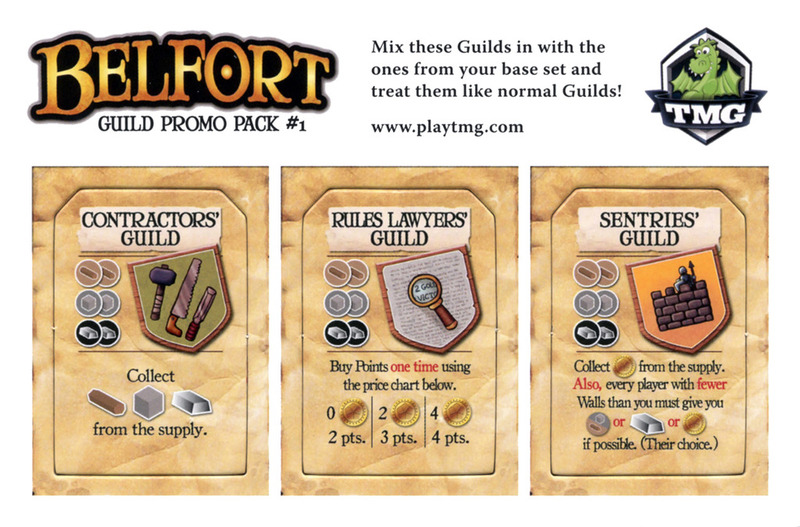 The Belfort Guild Promo Pack #1 is now available on the Boardgamegeek store for $5.00! What’s so special about these three new guilds? Well, first we have the Contractors’ Guild, which is a new Resource Guild and provides 1 Wood, 1 Stone and 1 Metal. This variety is nice and has been a favourite throughout all the playtesting! Next is the Rules Lawyers’ Guild – which is a great name for a guild! This guild allows you to break the rules of the game by getting points outside the normal ways. Always keep an eye on someone who continues to target this guild! Finally we have the Sentries’ Guild. This guild puts more emphasis on building walls! Usually they are buildings that are built near the end of the game, but now you can profit from them throughout the game! We hope you enjoy this mini-promo! On a side note: we’ve finalized the rules to our official expansion and it will be heading to our artist (the amazing Josh Cappel) very soon! Belfort’s in the Top 250 Games! 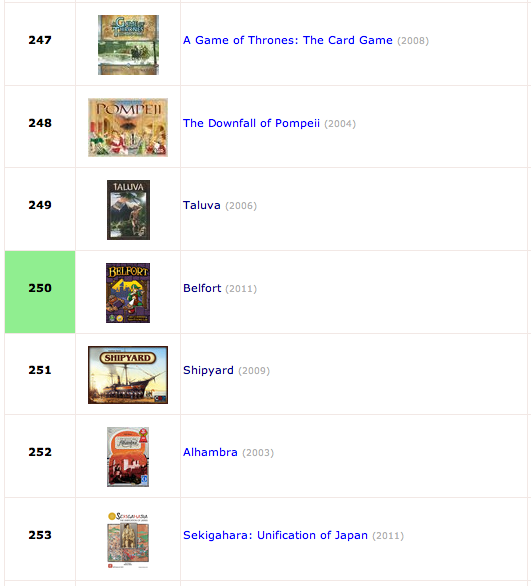 Today Belfort squeaked its way into the top 250 games of all time, according to boardgamegeek.com users. Users on this site (which can be anyone), rate the games and this allows the site to then compare and rank all of the games together. For those who need some context – the list is compiled of over 60,000 games! To make it a bit more fair, such that a new game with only 8 votes of 10 out of 10 doesn’t immediately grab the top spot on this list, bgg.com adds an unknown number of votes of 5.5 to each game. This means that each game needs a lot of votes to bring its average up. Because of this, all games start way down the list, and as they get more and more votes (assuming the votes are above 5.5! ), then the game climbs the list! It’s exciting to be recognized as a top 250 game by gamers! Thanks everyone who voted for the game!